The entire rifle and pistol facility in Bergerson Ranchettes will be closed on Sunday, Aug. 5th for a centerfire rifle turkey shoot. This will be a fun shoot, that will NOT be taken overly serious. Everyone from beginners and up are welcome and will feel comfortable. Bring plenty of $1 bills and any shade, non-alcoholic beverages, snacks, etc. This entry was posted in Other Events on July 11, 2018 by Custer Rod and Gun Club. Custer Rod and Gun Club will be hosting a concealed carry class on Saturday July 14th at the CR&GC rifle & pistol range. This will be an Introduction to Concealed Carry Class, taught by EDC Training LLC. This class is for the individual that may or may not hold a Montana Concealed Carry Permit and is wanting to learn more about the Defensive use of a handgun. This course is approved by the Custer County Sheriff for applying for a concealed carry permit. Custer Rod and Gun Club will be hosting a concealed carry class on Saturday May 19th at the CR&GC rifle & pistol range. This will be an Introduction to Concealed Carry Class, taught by EDC Training LLC. This class is for the individual that may or may not hold a Montana Concealed Carry Permit and is wanting to learn more about the Defensive use of a handgun. This course is approved by the Custer County Sheriff for applying for a concealed carry permit. This entry was posted in General News, Other Events on May 3, 2018 by Custer Rod and Gun Club. Saturday June 9th at 10am. This is a intro to precision rifle. All shots will be done from the prone position. Targets will be at distances from 300 yards to 600 yards with some additional targets out to 1000 yards. 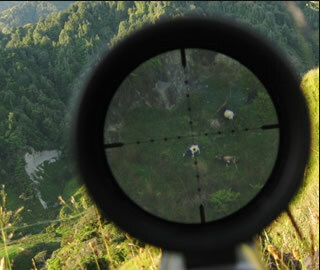 Not all Targets are required to be shot at. This is a fun learning tool to help with long range marksmanship either for fun or in a hunting application. 5 shots will be taken at each target. Round count will be approximately 40 rounds. A bipod will be very helpful during this. Shooting bags can be used as well. An adjustable turret optic makes things little easier but is not required nor expected. An optic that has more than just a duplex reticle aka BDC or Leopold Varmint helps as well. There is no charge for this event. 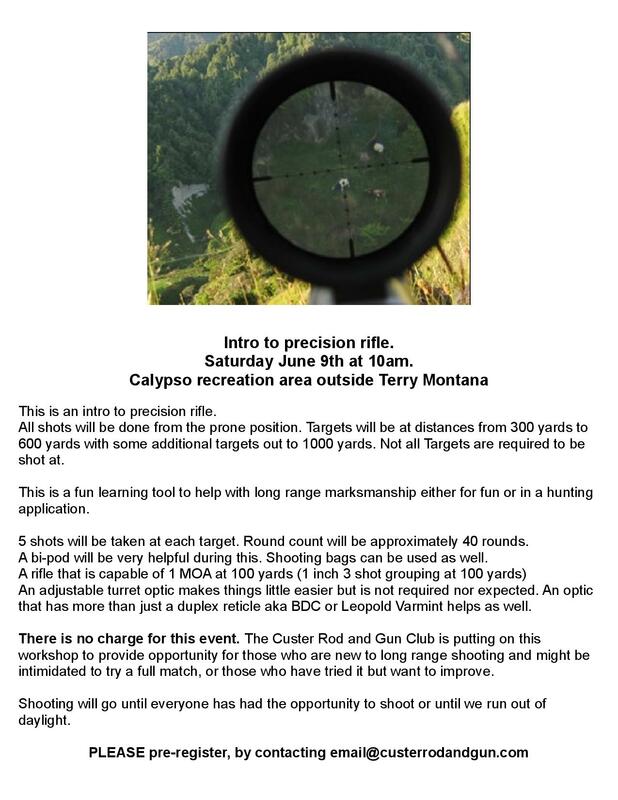 The Custer Rod and Gun Club is putting on this workshop to provide opportunity for those who are new to long range shooting and might be intimidated to try a full match, or those who have tried it but want to improve. Shooting will go until everyone has had the opportunity to shoots or until we run out of daylight. This entry was posted in General News, Other Events on April 20, 2018 by Custer Rod and Gun Club. Randy Hart who, who runs the club’s monthly Cowboy Action SASS match is considering adding a 3-Gun match either after the monthly SASS matches, or on another day, depending on the amount of interest in the event. Below are the details that Randy is thinking, but they are open to suggestions. If you have any interest in participating in a Cowboy Action 3-Gun please contact Randy Hart at 232 0727. THANKS! Time and Dates depending on interest. Can be held after the Cowboy Action shoot 3rd Saturday of the month. Colt 1911 or copy in 45 ACP. Any pistol cal lever action carbine or rifle. Win 97 pump or copy in 12 ga. Shot to be target grade, no slugs or mag shells. Any modern semi auto pistol, modern carbine or rifle, modern shotgun. Auto shotgun in seperate class. Pistol 1911 or copy 45 or 9mm, M1 carbine or copy, 30 carbine or 9mm, any non modern shotgun in 12 ga. No AP or Tracer Ammo. Any modern military pistol, rifle or carbine – not to exceed 30 carbine, 9mm AR prefered. NO .223 or 5.56. NO AP or Tracer. Any modern shotgun. Any combo of cat 1-5. Scoring Actual Time. Misses = +5 seconds per miss. Procedurals = +10 seconds, only one per stage. PS. Military note: Any of the many pistol cal semi auto only rifle or carbines may be used as per category classic or modern. This entry was posted in Cowboy Action, General News, Other Events on March 25, 2018 by Custer Rod and Gun Club. EDC Training LLC. Will be holding a class on Saturday April 30th, in Miles City. This will be an Introduction to Concealed Carry Class. This class is for the individual that may or may not hold a Montana Concealed Carry Permit and is wanting to learn more about the Defensive use of a handgun. This entry was posted in General News, Other Events, Upcoming Events on March 18, 2016 by Custer Rod and Gun Club. EDC Training LLC. Will be holding a class on Saturday Oct. 10th. at the Custer Rod and Gun Club’s range in Miles City. This will be an Introduction to Concealed Carry Class. This class is for the individual that may or may not hold a Montana Concealed Carry Permit and is wanting to learn more about the Defensive use of a handgun. This course addresses the effective concealed carry and use of the handguns popular today. The course will address the advantages and disadvantages of the various types, models, configurations and calibers of such Handguns, as well as the most effective support equipment and methods of concealed carry. The program consists of both classroom discussion, and live fire drills on the range. This course introduces the student to techniques applicable to defensive use of the handgun. Emphasis is put on shooting skill development for application in real-life circumstances. The fundamentals of Mindset, Gun-handling, and Marksmanship are covered in lecture while the practical aspects are taught on the range. Other course topics include Situational Awareness, equipment selection, safety, handling, loading, unloading, malfunction clearance, drawing and firing techniques. This entry was posted in General News, Other Events, Upcoming Events on September 22, 2015 by Custer Rod and Gun Club. EDC Training LLC. Will be holding a class on Sat. Oct. 10th. in Miles City at the Custer Rod and Gun Club range. This course focuses on the unique aspects of low-light / night encounters. 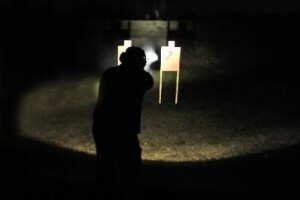 Topics include types of low light, visual capabilities and perceptions, equipment, firing techniques, and practical scenarios. * Good Quality “tactical” style Flashlight. 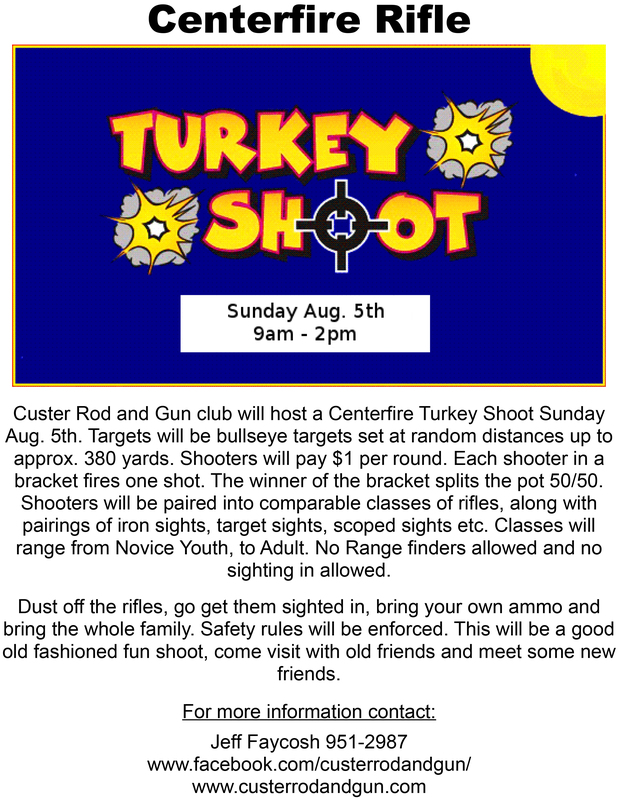 This entry was posted in General News, Other Events, Upcoming Events on July 19, 2015 by Custer Rod and Gun Club. 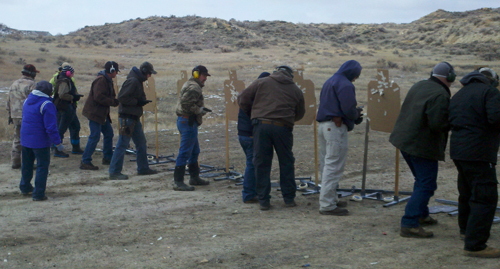 Custer Rod and Gun Club will be holding a class on Saturday April 11th in Miles City. 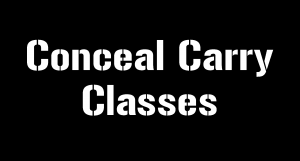 This will be an Introduction to Concealed Carry Class, taught by EDC Training LLC. This class is for the individual that may or may not hold a Montana Concealed Carry Permit and is wanting to learn more about the Defensive use of a handgun. 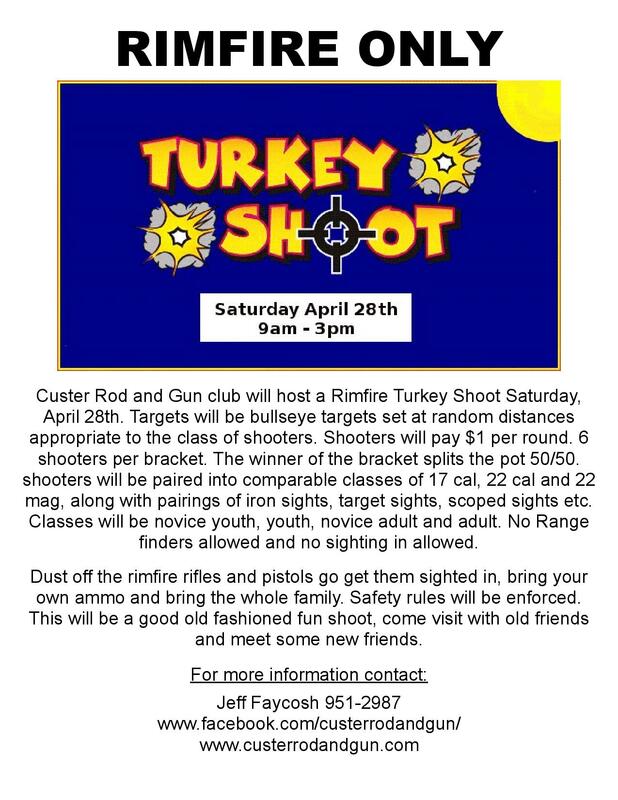 This entry was posted in Other Events, Upcoming Events on March 26, 2015 by Custer Rod and Gun Club. The annual CR&GC membership meeting and potluck/ banquet will be held at 6:00 pm on January 17th, 2015 at the VFW (Post 1579) 119 North 6th St. in Miles City. In traditional CR&GC style, the club will provide either pulled pork or roast beef and dinner rolls. Attendees A thru M are asked to bring a dish and N thru Z a salad or desert. With your 2015 CR&GC membership you will be eligible for a door prize of a $500 gift certificate to Red Rock Sporting Goods, there will also be multiple other prizes and drawings available including a Smith and Wesson M&P Shield. More prizes are accumulating as we speak and may include additional firearms. Eligible members must be present to win and legally eligible to own/possess a firearm if applicable. All prize and raffle availability is terminated at the conclusion of the annual club meeting. Please take a moment to thank the local businesses that have helped us out this past year: Car Quest, Cenex CHS, Doeden Const. Glader Electric, Dr. Jeff Williams, Kenny Boschee, MDU, Montana Fish Wildlife and Parks, Pacific, Red Rock, Reynolds Grocery, Western Powders Inc. and Big Sky Components. This entry was posted in General News, Other Events, Upcoming Events on January 1, 2015 by Custer Rod and Gun Club. “Introduction To Concealed Carry” class by EDC Training, LLC. Custer Rod and Gun Club will be holding a class on Saturday July 26th in Miles City. 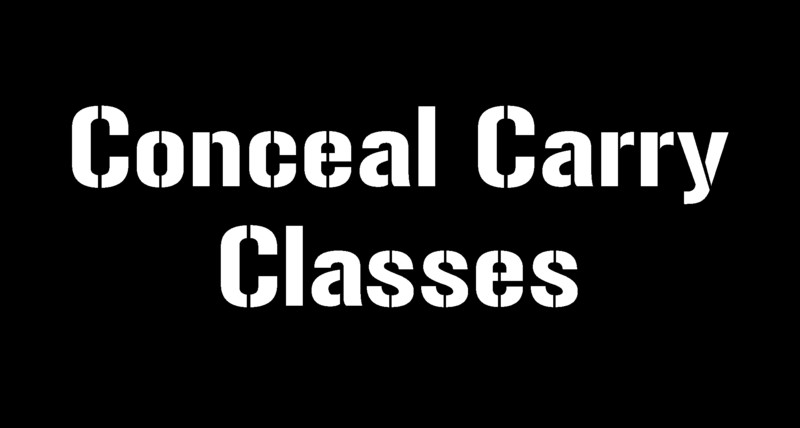 This will be an Introduction to Concealed Carry Class, taught by EDC Training LLC. This class is for the individual that may or may not hold a Montana Concealed Carry Permit and is wanting to learn more about the Defensive use of a handgun. This entry was posted in General News, Other Events, Upcoming Events on July 18, 2014 by Custer Rod and Gun Club. The Custer Rod and Gun Club will be holding it’s annual Youth .22 Instructional shooting league. All youths ages 8-18 are welcomed to participate at no cost. The club will provide all firearms and ammunition needed. Starting at 6:00 PM and running approx. 2 hours per night (depending on the number of kids) the league will be held Tuesday nights and run for 5 weeks. Participants will shoot about 50 rounds per night. We will cover safety in the class room and on the range. The first week (June 3rd) will be held at spotted eagle for safety and sign ups. Each week after that we will meet at the public shooting range behind the water plant. 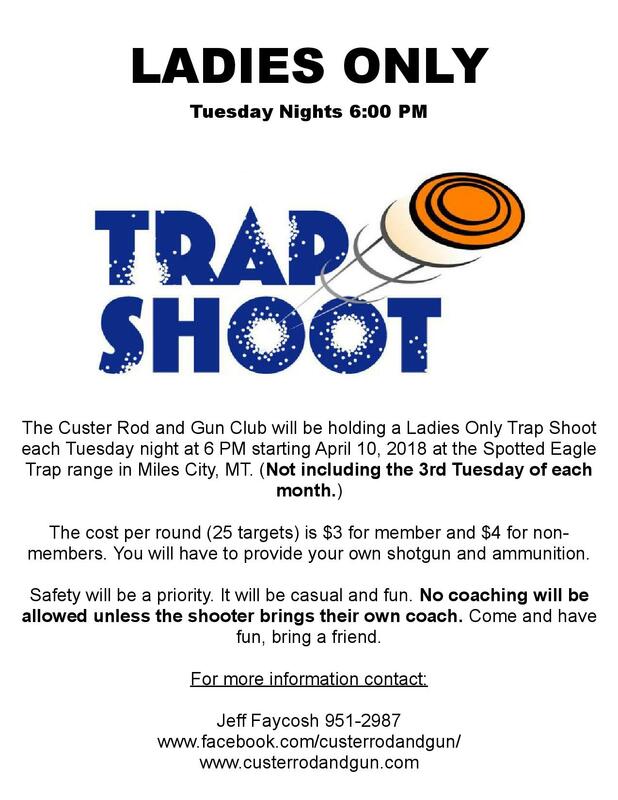 Parents MUST sign up their child, and the child must be present for the safety orientation at the Custer Rod and Gun Club at Spotted Eagle the first night, or they won’t be allowed to participate join the league later. This entry was posted in General News, Other Events, Upcoming Events on June 1, 2014 by Custer Rod and Gun Club. The swap meet has been postponed until later in the summer. We’ll post an update as soon as it has been rescheduled. We will be holding an outdoor/hunting/shooting related swap meet at the Spotted Eagle clubhouse on Sat. June 7. If you are interested in renting a table, the cost per table is $10, or $25 for 3 tables. Proceeds from table rentals will go to the Custer Rod and Gun Club’s general fund. Also the late club member John Hartwick’s family has donated many items from his estate to the club. These items will be sold at the swap meet and proceeds will go to support the club’s Youth .22 and Trap programs, which John has done so much to support in the past. Please contact Keith Hall at (406) 232-1449 or email us if you would like to rent a table or for more details. This is a great opportunity to support the your club and our youth firearm education programs! Note: The Run for the Gun/Dash for the Cash trap competition that was scheduled in conjunction with this event has been postponed until later in the year. This entry was posted in Other Events on April 28, 2014 by Custer Rod and Gun Club. Custer Rod and Gun Club will be holding a class on Saturday June 21st in Miles City. This will be an Introduction to Concealed Carry Class, taught by EDC Training LLC. 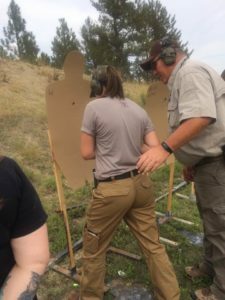 This class is for the individual that may or may not hold a Montana Concealed Carry Permit and is wanting to learn more about the Defensive use of a handgun. This entry was posted in General News, Other Events, Upcoming Events on April 28, 2014 by Custer Rod and Gun Club. The Custer Rod and Gun Club will be holding our monthly Meeting of the Board. Though only Members of the Board are allowed to vote on issues at board meetings, all club members are encouraged to attend these meetings, and will be provided opportunity to speak at these meetings on any subject discussed. To find the currant list of meeting dates and locations, check the 2014 Board Meeting schedule. See what was discussed at previous meetings by checking out the Board Meeting Minutes. 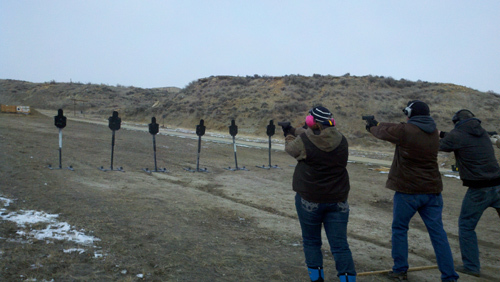 This entry was posted in Other Events, Upcoming Events on March 1, 2014 by Custer Rod and Gun Club.